We offer a full range of St. Petersburg property management services tailored to you as an investor, homeowner, or landlord. 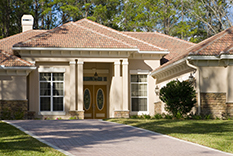 We have an extensive portfolio of single family homes, townhouses, condos, and apartments in the St. Petersburg area. The city of St. Petersburg was co-founded by John C. Williams, formerly of Detroit, who purchased the land in 1876, and by Peter Demens, who was instrumental in bringing the railroad terminus there in 1888. Located in Pinellas County, St. Petersburg is the second largest city in the Tampa Bay area. It was incorporated on February 29, 1892, with a population of a mere 300 people. It was named after Saint Petersburg, Russia, where Demens had spent half of his youth. A local legend says that Williams and Demens flipped a coin to see who would have the honor of naming the city. Demens won and named the city after his home, while Williams named the first hotel (built by Demens) after his birthplace, Detroit. The Detroit Hotel still stands, but has been converted into a condominium. The city is located on a peninsula between Tampa Bay and the Gulf of Mexico. It is connected to mainland Florida to the north, with the city of Tampa to the east by causeways and bridges across Tampa Bay, and to Bradenton in the south by the Sunshine Skyway Bridge which traverses the mouth of the bay. The Gandy Bridge which opened in 1924, was the first causeway to be built across Tampa Bay, connecting St. Petersburg and Tampa without a circuitous 43-mile trip around the bay. St. Petersburg's downtown has been rated among the best in the South due to its livability and myriad amenities. Jutting a half mile into the bay is the St. Petersburg Pier, a major tourist attraction with various activities. The University of South Florida St. Petersburg and a downtown branch of St. Petersburg College are located downtown. St. Petersburg has the third-largest dedicated public waterfront park system in North America, stretching 7 miles and used year round for public events, festivals and other activities. Straub Park is nearly a half mile long and home to the St. Petersburg Museum of Fine Arts. The Vinoy Park Hotel has a bay front location, a spot on the National Register of Historic Places, and an AAA Four-Diamond rating. 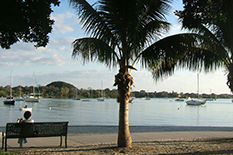 It fronts Vinoy Park, which frequently holds music festivals. Also noted for its arts community, St. Petersburg regularly places among the top 25 arts destinations in the nation. The Mahaffey Theater complex, the Morean Arts Center, dozens of other art galleries, Haslam's used book store, The Coliseum, Palladium Theatre, and Jannus Landing are among the galleries and cultural venues downtown. Several prominent museums are located in the perimeter. Many have received notable accolades, including the Chihuly Collection presented by the Morean Arts Center, the Museum of Fine Arts, the Salvador Dali Museum, the Florida International Museum, the St. Petersburg Museum of History, and the Florida Holocaust Museum. The Tampa-St. Petersburg area is represented by teams in four major professional sports (soccer, football, baseball, and hockey). The Tampa Bay Rays of Major League Baseball and Tampa Bay Rowdies of the North American Soccer League play in St. Petersburg proper, while the other two teams play in Tampa. All these teams are considered to represent the Tampa Bay metropolitan area. St. Petersburg is also well regarded for its beaches. Fort De Soto was rated the number one beach in America by the annual Dr. Beach rankings. The area's beaches are a short 10-mile drive from downtown.